Van Events Good News Weekly. Check out the latest Vancouver community events..
Read Vanevents.goodnewsweekly.ca news digest here: view the latest Van Events Good News Weekly articles and content updates right away or get to their most visited pages. Vanevents.goodnewsweekly.ca is not yet rated by Alexa and its traffic estimate is unavailable. We haven’t detected security issues or inappropriate content on Vanevents.goodnewsweekly.ca and thus you can safely use it. 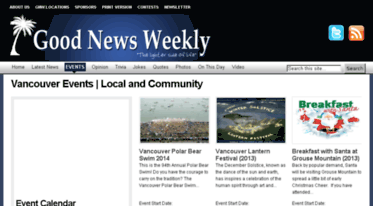 Vanevents.goodnewsweekly.ca is hosted with Google LLC (United States) and its basic language is English. Check out the latest Vancouver community events right here! This is the 94th Annual Polar Bear Swim! Do you have the courage to carry on the tradition? The December Solstice, known as the dance of the sun and earth, has inspires a celebration of the human spirit through art and music. The Solstice is acknowledged in every part of the world although the effects are different. Back by popular demand, Santa will be visiting Grouse Mountain to spread a little bit of early Christmas Cheer. If you have attended in previous years you will know that this event sells out fast! The Festival of Lights at VanDusen Gardens is back for another year! Loaded with lights and magical suprises, this is one event you don't want to miss.